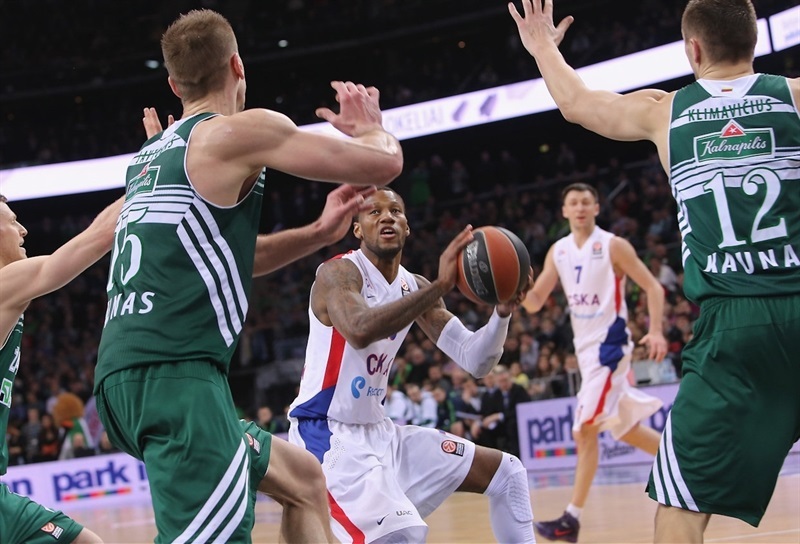 Aaron Jackson stopped Justin Dentmon in the closing seconds to deny a late comeback from the home team and secure CSKA Moscow’s 86-88 victory over Zalgiris Kaunas on Thursday at Zalgiris Arena. The Russian champs led by 9 early in the fourth quarter, but Dentmon took charge and helped lead the hosts back. 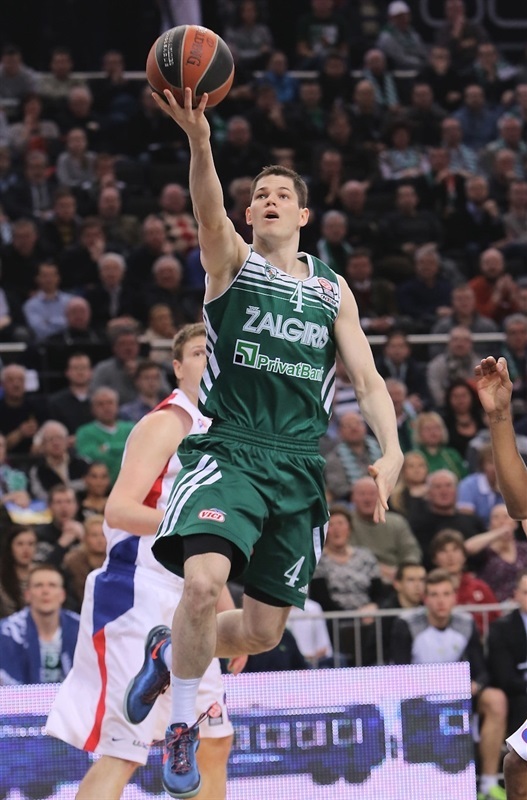 After Jackson split free throws with 10 seconds remaining, Zalgiris gave the ball to Dentmon, who watched the clock wind down before attacking, but Jackson was there and blocked the shot when Dentmon pulled up for what would have been a game-winning three. The result was CSKA’s 14th straight Euroleague victory over Zalgiris and lifted Coach Ettore Messina’s men to 8-1 in Group F and a step closer to the playoffs, while Zalgiris dropped to 1-8. Milos Teodosic led the winners with 16 points, Sonny Weems added 15, Vitaly Fridzon scored 12 on 4-of-7 three-point shooting, Jackson finished with 10 and Victor Khryapa dished 8 assists. Dentmon paced the Lithuanian champs with 28 points, Marty Pocius scored 20 and Robertas Javtokas added 14 in defeat. Khryapa flipped to a wide-open Kyle Hines for the game’s first score. Dentmon got the hosts going with triples on Zalgiris’s first to possessions before passing to Pocius for another and a 9-4 lead. Teodosic answered from downtown. After Javtokas scored on the offensive glass, Nenad Krstic’s baseline jumper made it 11-10. Vytenis Lipkevicius helped Zalgiris stay in front with a tip-in and a three. Weems buried a short jumper before Teodosic stripped Dentmon and went in for a layup that tied the score at 16-16 before the TV timeout. 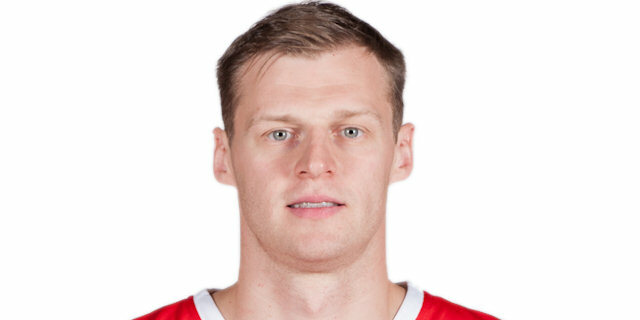 Tadas Klimavicius shined with a block of Weems before picking up a steal that led to a Dentmon layup. CSKA went ahead on a Sasha Kaun free throw and Andrey Vorontsevich added to the cushion. Sarunas Jasikevicius played the pick-and-roll perfectly for a Mindaugas Kupsas layup. A Vytenis Cizauskas layup left Zalgiris within 22-23 through 10 minutes. CSKA took charge as Vorontsevich and Fridzon sandwiched threes around a Kaun score. An Aaron Jackson jumper capped a 0-10 run that gave the visitors their first double-digit lead. Javtokas attacked the rim for a slam, but Fridzon nailed another triple to make it 24-36. Klimavicius scored off an inbounds pass and Dentmon went coast to coast for a layup. After a timeout, a Javtokas spin move resulted in a basket that cut the difference to 6. Weems fed Krstic for a slam, but Klimavicius answered inside. Dentmon drew a pair of quick fouls from Teodosic and sank the resulting 2 free throws. 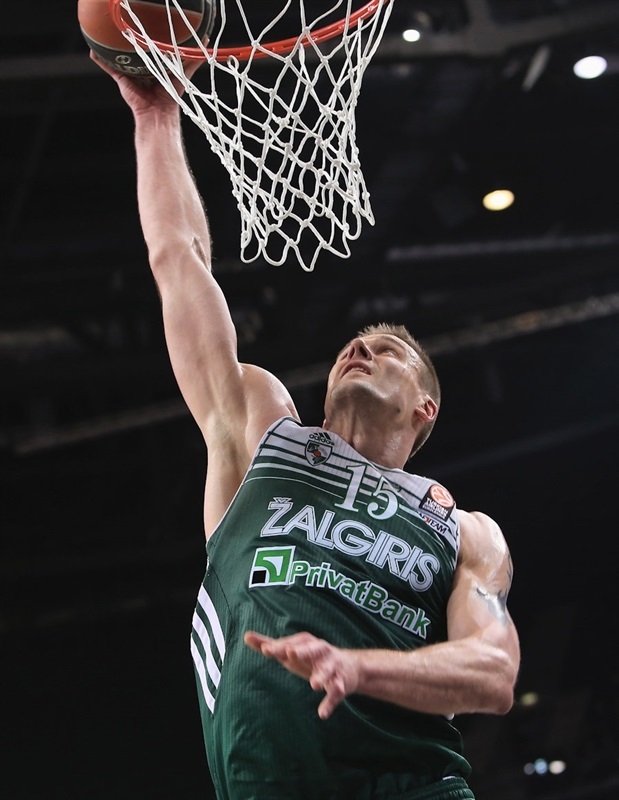 Dentmon fed Javtokas for an easy slam to bring Zalgiris within 36-41. Klimavicius added a turn-around jumper, but Vladimir Micov scored inside and a botched Zalgiris rebound led to an easy Jackson basket. Weems buried a pull-up jumper in the closing seconds of the half to make it 38-47. Kaun restored a double-digit difference to open the half, however baskets by Pocius and Javtokas gave the fans what to cheer about. Weems and Pocius traded threes and the latter then drove to the basket to trim the gap to 47-52. Khryapa scored his first points with a mid-range jumper. Dentmon drew another foul from Teodosic, which resulted in a seat on the bench for the mercurial CSKA guard. A Dentmon three made it 52-54 midway through the quarter. Pocius pulled up for a three that capped a 13-2 run and Zalgiris’s first lead since the first quarter. The lead traded hands on five consecutive possessions, culminating with Krstic free throws to make it 59-60. 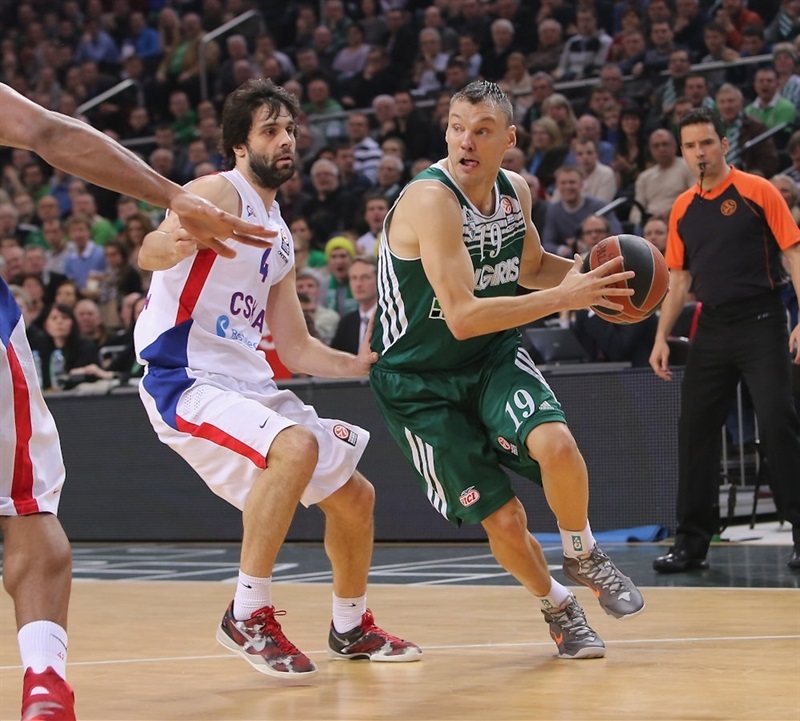 But soon Jasikevicius pulled up for a jumper – his first points. A wild Dentmon triple and A Fridzon three from the corner left CSKA up 64-65. Teodosic buried a three to quiet the crowd. Then Fridzon made another. A Tomas Dimsa triple was matched by Teodosic’s third three. Vorontsevich’s steal led to a Hines basket and a Zalgiris timeout. After a timeout, Lipkevicius drove for a reverse layup to bring the hosts within 69-76. Pocius attacked the rim, scored and drew a foul from Khryapa to make it 74-77 midway through the quarter. Dentmon went hard to the rim, but was called for an offensive foul, which was his fourth personal foul. 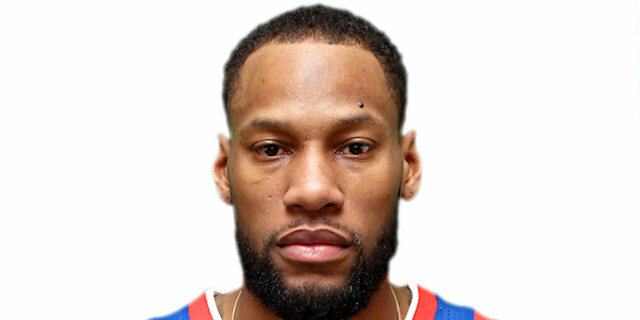 Hines restored a 6-point CSKA cushion from the line. Javtokas and Weems traded free throws. 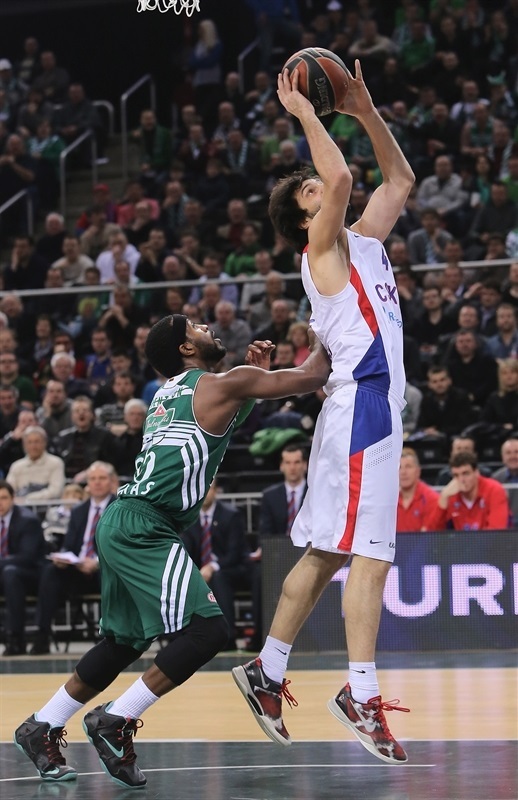 Then Teodosic added a pair to make it 76-84 with less than three minutes to play. Dentmon drew a foul shooting a three and made 2 of the resulting 3 free throws. Javtokas made it 82-87 with 52 seconds remaining. Then Dentmon free throws brought Zalgiris within 3 with free throws with 21.5 seconds left. Zalgiris stopped Hines and Pocius made it a 1-point game with 11.6 seconds to go. 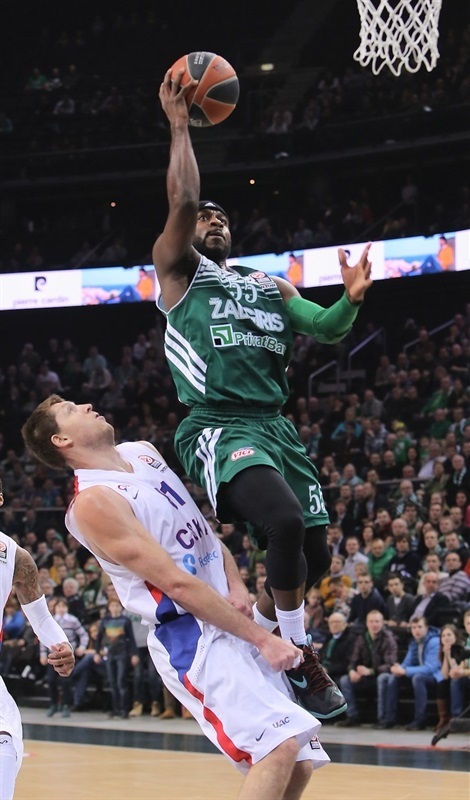 Zalgiris quickly fouled Jackson, who split free throws and gave Zalgiris a chance to win it. 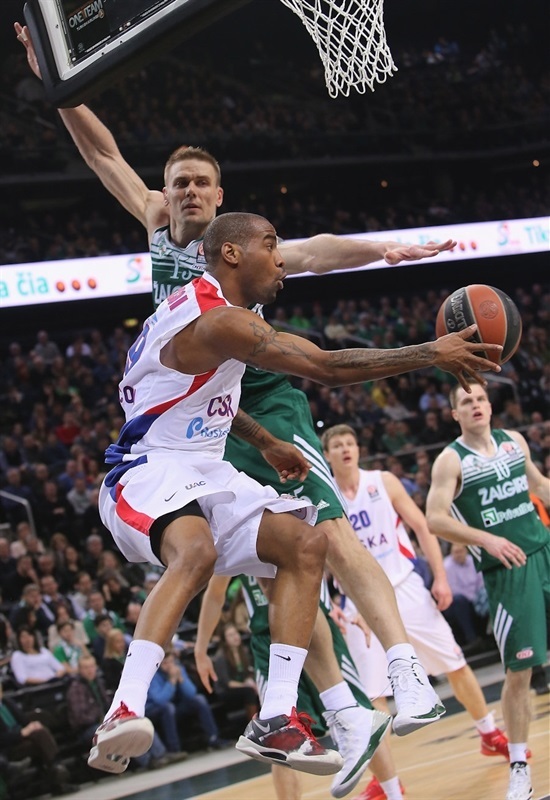 The hosts got the ball with 7.9 seconds left, but Jackson denied Dentmon in the final second to secure a CSKA victory. "First of all I want to thank our fans, who came to the game and were super loud. It was motivating us a lot. CSKA has the best defense in Europe, so we are happy to score so many. We were missing Paulius Jankunas, but other players filled in really well. We had to play with a smaller lineup and we succeeded most of the time. I’m happy with how the players contributed, unfortunately we couldn’t create the last shot. We were a bit unlucky in the end." "It was a really good game for the fans. The offensive players dominated the game. 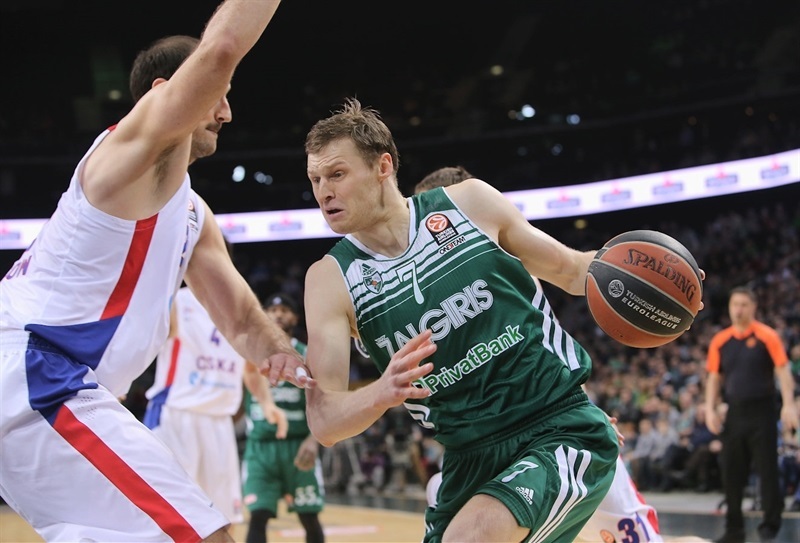 Zalgiris played with great enthusiasm and aggressiveness. We scored almost 90 points, had 112 index rating points, but our defense was too up and down. The same happened last week, but right now we have some little nagging injuries, so it was great that some other players stepped up." "The game was really good. We had to fight to the bitter end. We had a chance to win against a very good team. Of course, the last shot was not successful because we didn‘t make it. Unfortunately, CSKA’s defense was very good. Otherwise today we fought, which we might not have previously. This time we were really fighting till the end, it is truly commendable. And even knowing what kind of lineup we played - practically all the time with four small players. The fan support was just fantastic, for sure we missed that atmosphere, so it is very unfortunate that the fans did not receive a victory. This game was generally some sort of step forward in terms of quality; I hope that the next game will be even better. " "It is great feeling to come back here where I started my European career. Zalgiris Arena is really a great place to play and Zalgiris has great fans. Today was a really good game for Zalgiris, but we did a better job in the end of the game, so we got our victory. All the game was crazy with crazy shots and both teams were good in offense. We have some days till the next game and we have to do a better job and start thinking about the next part of the season. We came here for the win and we are happy that we got it. "